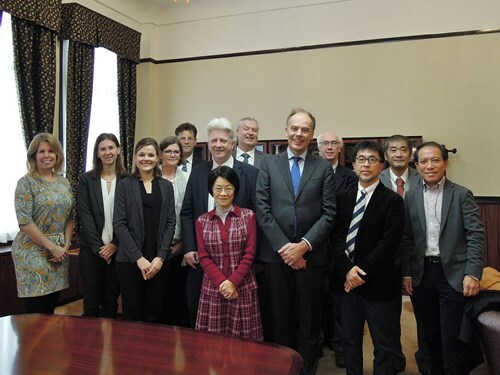 A delegation from Leiden University in the Netherlands, headed by Prof. Carel Stolker, president and rector, visited Kyoto University on November 22, 2017. 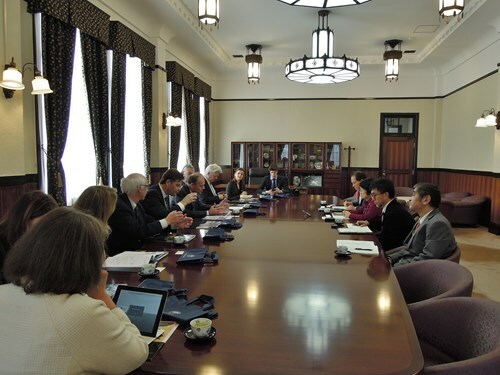 They met with Dr. Kayo Inaba, executive vice-president for gender equality, international affairs, and public relations to discuss the potential for further research collaboration and student exchange between the two universities. After the meeting, some of the delegates visited the International Education and Student Mobility Division to explore the possibilities for student exchange in more detail. Some members of the delegation also visited the Graduate School of Science, Graduate School of Informatics, Graduate School of Human and Environmental Studies, Center for Southeast Asian Studies, and the Graduate School of Law.